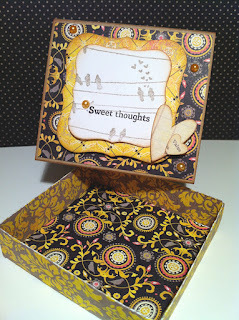 When you think of a box of candy, do you think frills and fluff? Not that that's a bad thing, but how about a little vintage chic, or some might call it a masculine bit of sweetness. 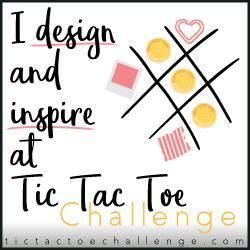 This is a candy box that six Nugget-type candies can fit into. 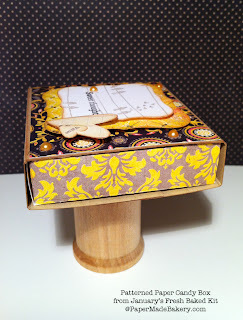 I made a couple of these boxes with both kraft cardstock and Blissful patterned paper from Paper Made Bakery's January Fresh Baked Kit, plus some fun embellishments we'll chat about in a minute. Once the box bottom is made you can either leave it just like it is or have some fun decorating the inside. Remember, you'll place those tasty chocolates inside, but why not leave something pretty to look at after the candy's gone? 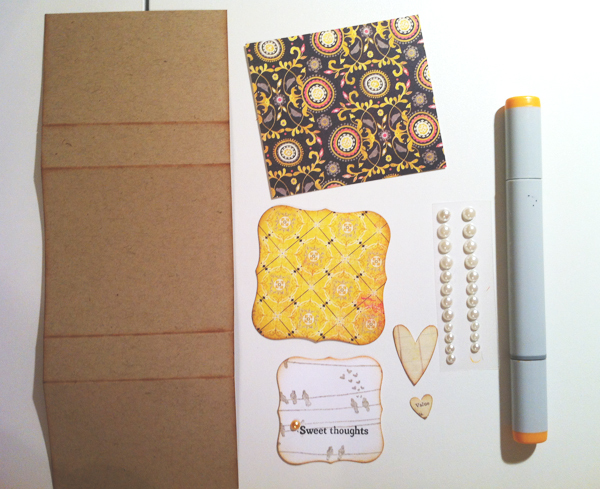 The inside of the kraft box bottom is simply a corner of one piece of the patterned paper and the "I love you" stamp is from Sweet Stamp Shop's Sentimental Birds set, which is also included in the Fresh Baked Kit. I edged all the paper pieces in Tea Dye Distress Ink and cut two pieces (one patterned and one white) of paper with Spellbinders' Labels One dies. 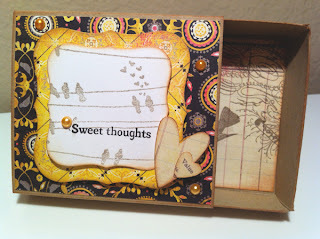 I used the Sentimental Birds stamp on the smallest Labels One piece with SU's Sahara Sand ink, then stamped the sentiment "Sweet thoughts" in black ink. 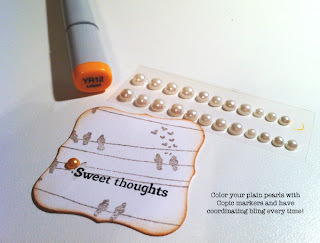 Here's a fun thing to remember if you need a quick color coordinated embellishment and all you have are little white pearls -- color them with a matching Copic marker! The alcohol ink will happily "stick" to the pearl and you'll have matching bling every time! For these pearls I used YR 12 (Loquat). Did you notice all four colored pearls on the box top? 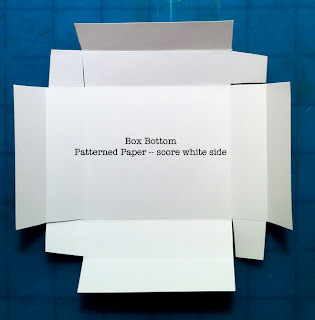 To create the box top simply score the cardstock at 2" and then 2.75" from each end. This creates a sort of belly band. 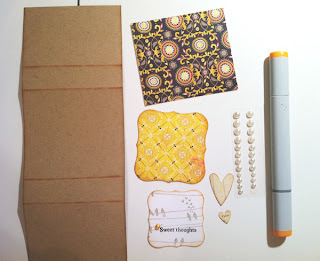 Decorate with patterned paper and embellishments as described. This was a quick and simple project that can be made into party favors or even small gifts for your co-workers or pals. 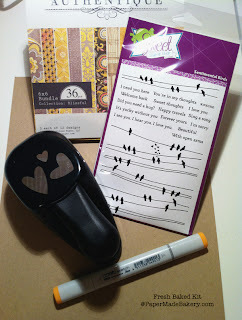 I'm going to use this one for my sweetie's Valentine's Day gift! Ohh love this!! Just fabulous!